and why is it called The Miracle Enzyme? WHY IS SERRAPEPTASE SO GOOD? Dead or inflamed tissues are two of the key causes of the majority of ailments in the body. Serrapeptase actually dissolves non-living tissue such as blood clots, cysts, arterial plaque and all other inflamed tissue. By removing inflammation, serrapeptase enables the body to heal itself. Contains 250,000IU of Serrapeptase, the highest strength Serrapeptase supplement to provide powerful healing and support normal body processes. 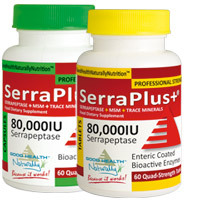 Serrapeptase is an organic proteolytic enzyme that produces anti-inflammatory mediators in the body. Supports a variety of health conditions and may benefit lung health, sinus activity, fluid balance, joint mobility and post-surgical recovery. 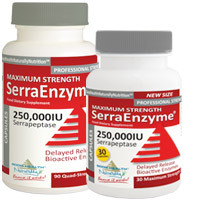 SerraEnzyme™ 250,000IU is available in delayed release capsules for optimum systemic delivery. 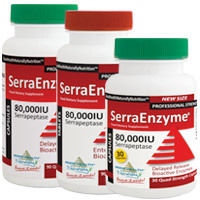 SerraEnzyme™ 80,000IU contains Serrapeptase, an organic naturally occurring proteolytic enzyme that can support a variety of healing processes in the body. By producing anti-inflammatory mediators to support the body’s natural anti-inflammatory processes, Serrapeptase benefits a wide variety of health conditions. SerraEnzyme™ capsules are delayed release, taken on an empty stomach and activated in the small intestine rather than in the stomach. Contains 80,000IU Serrapeptase, MSM and Trace Minerals in delayed release capsules to support normal lung, joint, tendon and connective tissue health. SerraPlus+™ provides a nutritional enzyme and mineral complex with pure MSM, formulated together in a pure quality combination supplement to support your everyday health. The SerraPlus+™ formula has no known negative side-effects and can benefit your everyday diet as part of a healthy lifestyle. Contains 80,000IU of Serrapeptase per tablet, giving you an organic, naturally processed proteolytic enzyme with researched anti-inflammatory mediating effects. 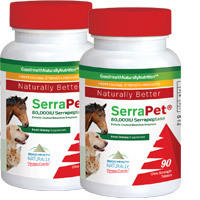 SerraPet™ is a nutritional enzyme known for its pure quality and high strength, when used as part of your pet’s everyday nutrition. Contains four key ingredients including Curcuminx4000™, Ecklonia Cava Extract, Serrapeptase and Vitamin D3 in one vegetarian capsule. These core nutrients form a super-supplement that studies show targets dozens of health and aging-related issues. 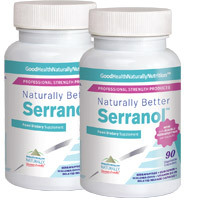 Serranol™ is a powerhouse of ingredients that fight premature aging and compromised health. Serranol™ can boost your body’s total health support and may benefit normal cholesterol levels, circulation, joints and cell health. Provides a high level of support for healthy arteries and cardiovascular system. The Blockbuster formula is ideal for reducing inflammation, while promoting healing and internal cleansing. 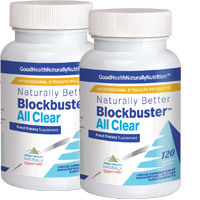 Each ingredient in the Blockbuster AllClear™ formula has numerous testimonials relating to reducing blood pressure, arterial cleansing and lung support. Robert Redfern’s famus book os Serrapeptase. The ‘Miracle Enzyme’ tells the incredible story of how Serrapeptase has been researched and safely used to benefit many health conditions – without any signs of unwanted side effects. 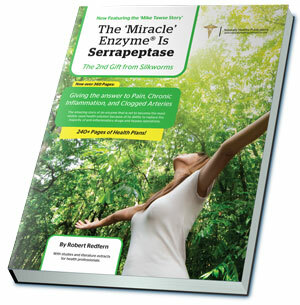 Download a free copy of “The Miracle Enzyme is Serrapeptase” a 365 page ebook by renowned health coach and nutritionalist, Robert Redfern, of Naturally Healthy Publications. To purchase a printed version of the book, please visit Good Health Naturally.